Over the years, regional and local labour market observatories have provided reliable and targeted labour market information and intelligence for regional and local decision-makers. Recent developments show that they are increasingly expected to fulfil tasks beyond mere data provision and analysis. Hence, they are emerging as interpreters, evaluators and mediators in regional and local governance and development efforts. Their participation in the planning, implementation and evaluation processes creates spaces for new alliances, cooperations and networks. However, the observatories often lack essential resources for fulfilling their complex new tasks. Stable sources of financing and employees with a solid and up-to-date skills base are essential for regional and local observatories to meet the new requirements. However, acknowledging their contribution to regional and local governance and development processes as well as adequate opportunities for exchange with different actors across Europe are equally important. How do the changing framework conditions affect the functions of regional and local labour market observatories? To what extent do shifts in their roles take place? Which patterns of changes can be observed across different European countries? How stable are the new arrangements and where do the observatories need support? 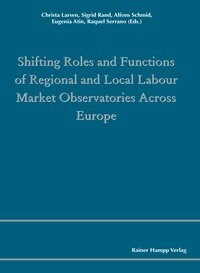 This publication explores the shifts in the roles and functions of regional and local labour market observatories in different European countries as well as the framework conditions influencing their operating and further development.